Kristi Finney had known people throughout her life who’d been victimized by vehicular violence. But nothing can prepare you for losing a child. With time, however, Finney found a way to channel the grief and pain and isolation into action. Since losing her son, Finney has become one of the Portland region’s most energetic and compelling advocates for traffic safety reforms. She is the founder of Oregon and Southwest Washington Families for Safe Streets, modeled after the chapter in New York City. 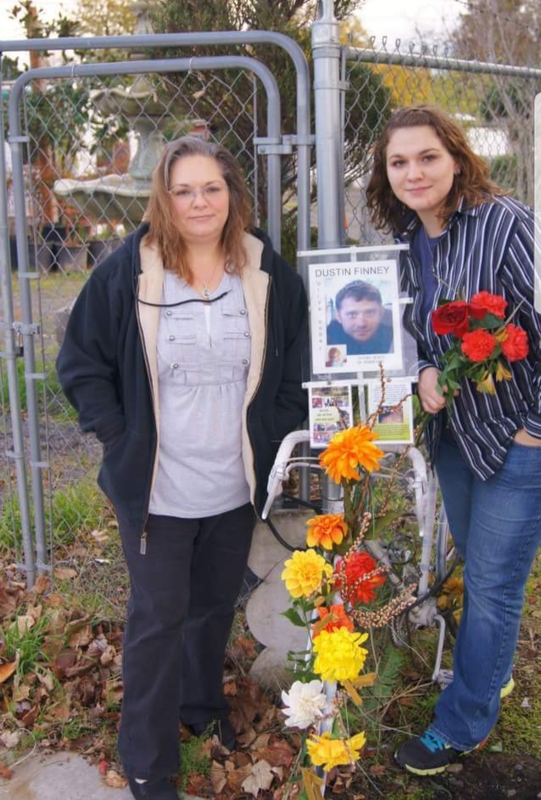 Kristi Finney, left, at a roadside memorial for her son Dustin. Finney now speaks around the Portland region about safe driving, and she advocates for city-level policy reforms. She feels compelled to act so other mothers and fathers don’t get a knock on their door like she did. Finney found herself obsessively reading every news item about her son, including the comments section. Even though Dustin was killed by a drunk driver who was eventually sentenced to five years in prison, she encountered a surprising lack of sympathy. Finney had never been an activist. But during the four-month trial for her son’s killer, she resolved to speak up. Soon after Dustin’s death, Mayor Sam Adams invited Finney to attend Portland’s annual transportation safety summit. She spoke about her loss and why the city’s initiatives to prevent crashes matter, and she met other families whose loved ones had been killed in traffic. The momentum took off from there. “I would get calls from the media if there was a bicycle crash because people knew about me,” she said. Finney started talking about the trauma she went through to “high-risk drivers” — part of a court program to prevent repeat offenses by people arrested for DUI or who’ve had their license suspended for other dangerous driving offenses. She now recounts what it was like to lose Dustin in six different counties every month. Jonathan Maus, the publisher of Bike Portland, says Kristi stands out among the many advocates he’s encountered while covering Portland’s bike scene the last 13 years. Currently, Finney and Families for Safe Streets are campaigning to get the city to redesign Division Street, where Dustin was killed. It’s a nine-lane road and one of the most dangerous in the city. In 2016 alone, five people were killed in crashes on Division Street. Portland’s Families for Safe Streets now has a Facebook group with about 60 members, and about six are heavily engaged in advocacy. Speaking up and revisiting such a painful experience isn’t an easy path, and most people Finney approaches about joining her decline to do so. Kristi has been an amazing advocate. Her ability to channel the energy from her loss into so much positive energy is inspiring. In 2016, traffic deaths in America have continued an alarming upward trend, and are expected to reach about 35,000 by the end of the year. we are seeing an alarming spike in deaths. But statistics alone can numb us to the staggering human suffering they represent.